This is a tall and conspicuous plant of fens and swampy lakemargins. The flowers are tiny, but massed into the familiar brown heads, female and seed-producing near the top, male below, Seeds are wind-borne late in the year whem the heads break up. The plant is properly called "reedmace", but the name "bulrush" has been so often misapplied that we can now take that as the common name. 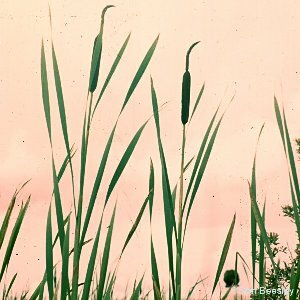 All names: Typha latifolia L.